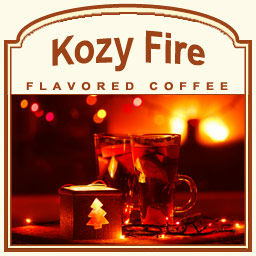 Pretend you�re curled up next to a fire, underneath a blanket of stars with this Kozy Fire coffee creation. This roasted almond and cinnamon inspired flavored coffee features a hearty, wholesome flavor that will make your taste buds crave its cozy warmth. With only 2 calories in each cup, you can indulge in this relaxed cup of coffee and its true gourmet taste. Made with 100% authentic Arabica beans, this flavored coffee will hit the spot with its subtle spiciness and cinnamon-inspired heat. Roasted and shipped on the same day, the Kozy Fire flavored coffee will enlighten your senses with its high quality flavor. Preserved in a heat-sealed valve bag, our flavored coffee will have optimal freshness in each and every cup. Go ahead and sing your favorite campfire songs � this Kozy Fire is worth celebrating!